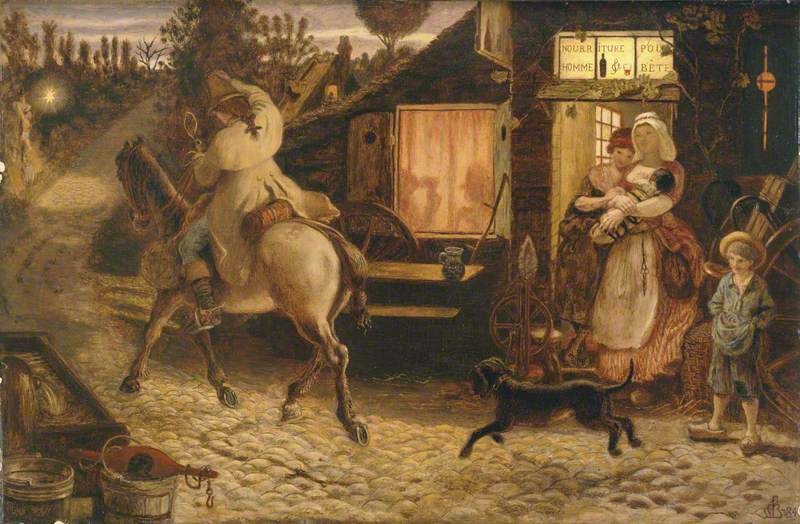 In this night scene, inspired by Victor Hugo's ballad "A Un Passant" of 1825, a horseman rides on past an inn, followed by his dog. Everything there beckons him to stay. Outside the inn is a charming family group, and over the door is a sign in French offering refreshment to both man and beast. Guests can be seen within, behind the lighted window. But he seems to be lured on by a little light in the distance. It is glowing beside a crucifix: according to Ford Madox Ford, it is "a lamp at the gates of a chateau" (230), but according to Julian Treuherz, it is a light by a little shrine (228). The original work was a "characteristic and poetic drawing" for the poem (Ford 160), which, according to Ford, was published with his own translation of the poem, Once a Week. By then, Brown had already become involved enough in the subject to start painting it in oil as well, but finished it only much later. It is characteristic of Brown not only in its poetic atmosphere but also in its evocative details, few of which are in the poem itself. Ford, Ford Madox. Ford Madox Brown: A Record of His Life and Work. London: Longmans, 1896. Internet Archive. Web. 20 July 2017. Treuherz, Julian, with contributions by Kenneth Bendiner and Angela Thirlwell. Ford Madox Brown: Pre-Raphaelite Pioneer. London: Philip Wilson, 2011.